The Gunnedah Showground was little more than a clearing in a pine scrub when the fledgling Gunnedah P A & H Association conducted its first show in 1888. The annual show was the most important event of the year in the early 1900s. Crowds arrived by horse and buggy, spring cart, on horseback and on foot. Trains ran at excursion rates to bring visitors from across the region and those that could afford it bought outfits for the social and sporting event of the year. For many people, particularly those from outlying villages, the show was one of the few times they came to town. 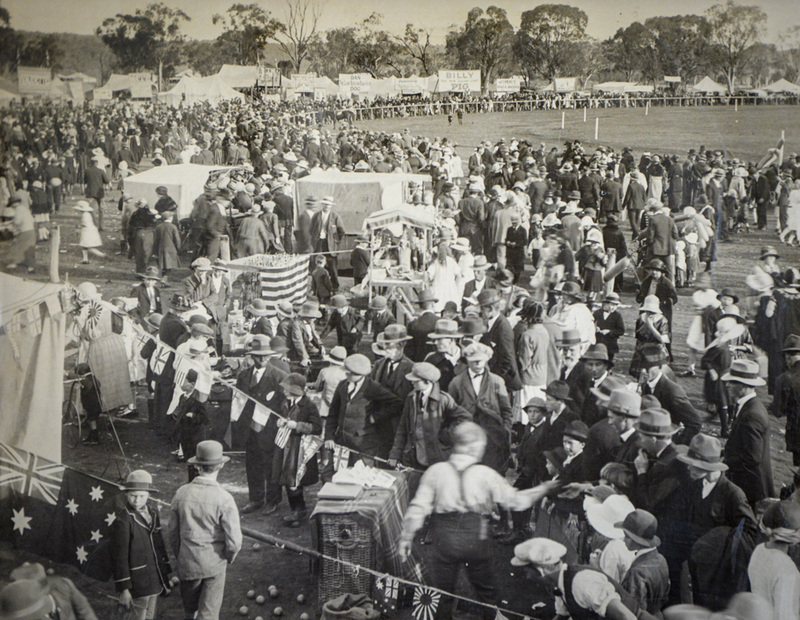 With the exception of couple of early years where severe drought caused its abandonment, and during the Great Depression, the Gunnedah Show has been held on the same grounds in South Street. The first show was hailed a raging success. The Sydney Mail, under the heading “Gay Gunnedah” reported that “the first show…. was a great festival week for the town”. Festivities included the first annual meeting of the Amateur Turf Club, a ministerial visit (the Minister was not named), a banquet by the Church of England Council, three balls and a live pigeon shooting match. The Mail reported that the area was in drought and “the dust rose in great clouds”. “Hotels were overcrowded, beds were unprocurable. Many visitors came from Sydney,” the report stated. A highlight of that event was the unveiling of the Wolseley shearing machine. Geddes’ special prize of £20 was awarded for the best 20 ewes fleeces shorn by the steam powered machine. Times have changed. Wool is no longer king and agriculture has seen economic fluctuations. Such is the diversity of the town that the animal nursery, which would have been greeted with boredom by most families a century ago is now a star attraction. The horse events remain a principal attraction for many people attending and competing in the show, particularly showjumping. The show dubbed “the Royal of the North” 40 years ago continues to live up to its reputation drawing visitors and competitors from across the north and further afield. The Gunnedah Show Society is a non-for-profit organisation serving the community. It is made entirely of volunteers who give their time effortlessly to provide an opportunity for people from across the region and interstate the opportunity to participate in an agricultural show. Gunnedah is the hub of one of Australia’s richest agricultural regions – the Liverpool Plains in North West New South Wales and is located on the Kamilaroi and Oxley Highways. The Gunnedah Showground is located in the centre of Gunnedah and is close to all facilities and is well laid out with plenty of parking and has one of the best arenas in New South Wales. You can watch the action from every point and enjoy great country hospitality. One of the things that bring people back each year is the true country spirit and hospitality. The facilities have been built by volunteers and continue to be updated as changes are needed. As the population and industries change locally so does the show – catering for a wide range of interests. Gunnedah Show Society holds many events during the year which include – the Annual Show, Campdraft, Agquip Rodeo, Country Music Muster, and Rose Show and support numerous other events by volunteering their time. We hold our monthly meetings on the first Wednesday of the month at 6pm under the grandstand at the showground. We welcome new members who would like to become ‘part of the Show’ so get in touch and find out how you can get involved and join our friendly team of volunteers. Above: Gunnedah Show in 1924 and below, another old photo taken in 1922. We hold our monthly meetings on the first Wednesday of the month at 6pm under the grandstand at the showground. All welcome! Our AGM for 2018 will be held Wednesday 5 September at 6pm under the grandstand at the Gunnedah Showground.